Product prices and availability are accurate as of 2019-04-14 10:46:39 EDT and are subject to change. Any price and availability information displayed on http://www.amazon.com/ at the time of purchase will apply to the purchase of this product. The 10-Piece Combo Set meets all of your plastic-free grocery shopping needs! Use the mesh Reusable Produce Bags for your fruits and veggies, and the cotton Reusable Bulk Bin Bags for your favorite bulk foods like nuts or granola. They are both made of durable and natural cotton material, and are free of any synthetic plastic-based materials such as polyester or nylon. Other reusable bags, made of synthetic plastic-based materials can take hundreds of years to biodegrade. Machine washable. (Dry on delicate/low heat or hang to dry.) The strong double-stitched seams on these bags is of the highest quality. They have a stainless steel cord lock instead of plastic. We have color-coordinated the labels with a rainbow theme so you can quickly grab the size you need. (Red/Orange/Yellow are Small, the four shades of Green are Medium, and Blue/Violet/Purple are Large.) 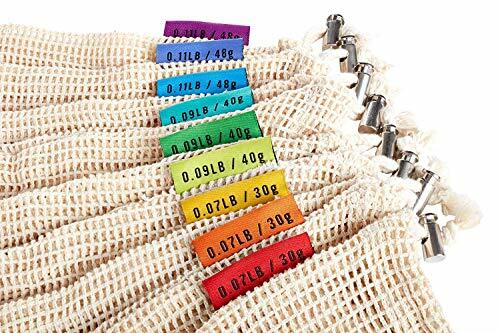 The tare weights are printed on the back of the labels so the cashier can easily deduct the weight of the bag. 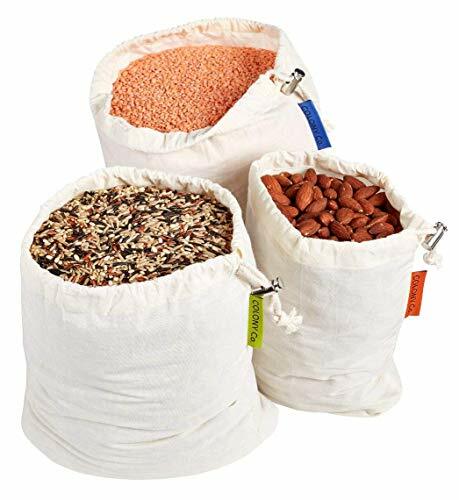 Weights are given in both english and metric units, so the bags can be used anywhere in the world. OUR PACKAGING IS PLASTIC-FREE AND RECYCLABLE! The bags are packaged in a beautifully designed, cube-shaped cardboard box. Join us in working toward a zero waste lifestyle, and saying no to plastic and synthetic materials. THE 10-PIECE COMBO SET MEETS ALL OF YOUR PLASTIC-FREE GROCERY SHOPPING NEEDS! 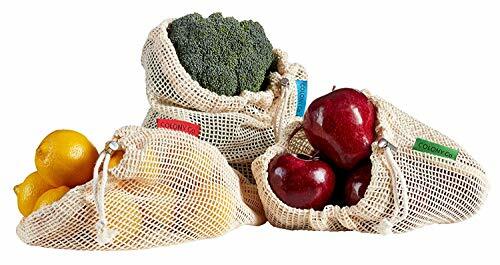 Use the mesh Reusable Produce Bags for your fruits and veggies, and the cotton Reusable Bulk Bin Bags for your favorite bulk foods like nuts or granola. 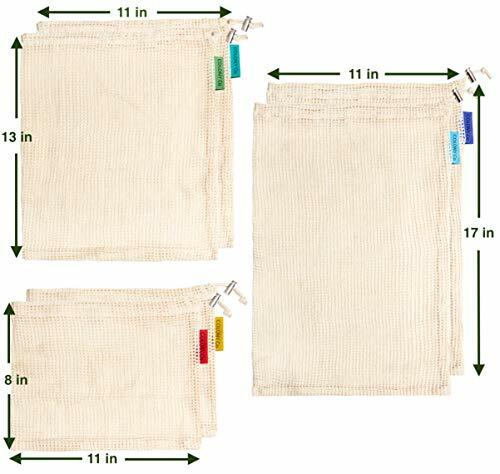 MULTIPLE SIZES: Six mesh Reusable Produce Bags: 2 Large (17x11 inches) 2 Medium (13x11) 2 Small (8 x 11) | Four muslin Reusable Bulk Bin Bags: 1 Large (15x12 inches) 2 Medium (12x10) 1 Small (10 x 8) OUR NATURAL COTTON mesh and muslin materials are polyester-free, nylon-free, unbleached and biodegradable. 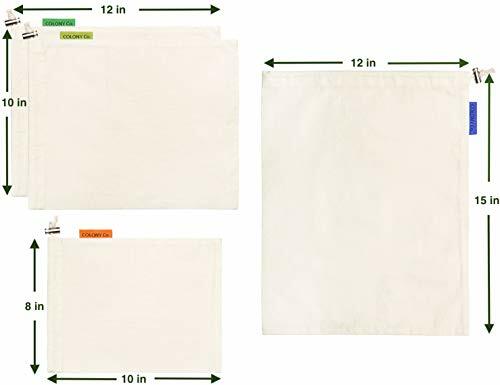 Other reusable bags, made of synthetic plastic-based materials can take hundreds of years to biodegrade. DURABLE material and strong double-stitched seams. MACHINE WASHABLE (Dry on delicate/low heat or hang to dry. High heat can cause shrinkage.) We use STAINLESS STEEL cord locks instead of plastic. The TARE WEIGHT is on the brightly colored labels so cashier can easily find it and deduct the bag's weight. OUR PACKAGING IS PLASTIC-FREE AND RECYCLABLE! 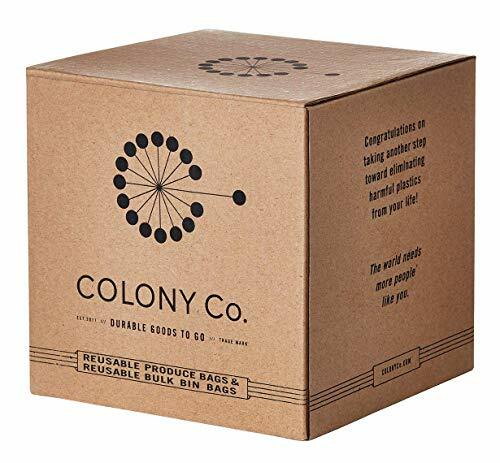 The bags are packaged in a beautifully designed, cube-shaped cardboard box.